Explore, Learn, Have Fun! : A hotel close to Disney World and the beach? Orange City is your destination! A hotel close to Disney World and the beach? Orange City is your destination! 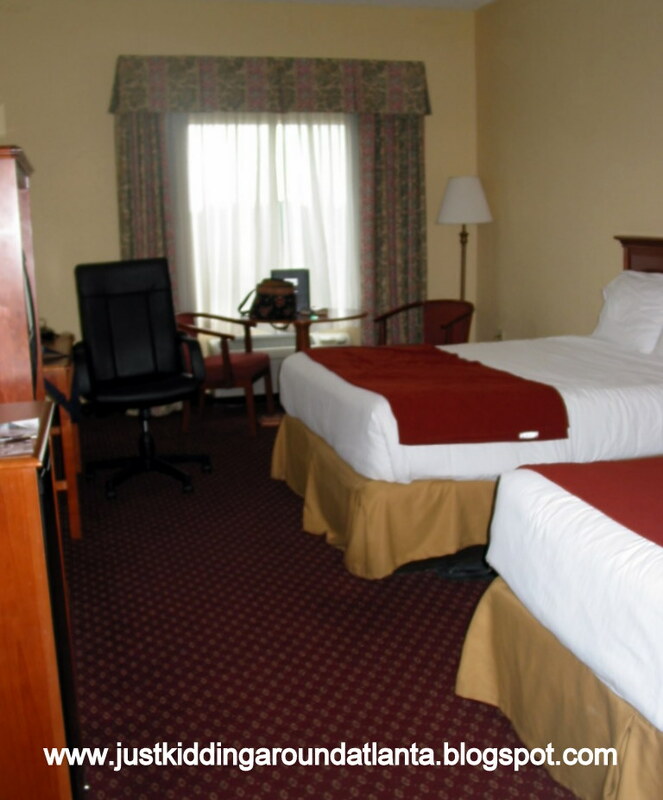 Looking for a nice hotel on the way to Disney? Want to be close to the beach? Orange City is a great stop between the two! A few months ago Dena, the General Manager of the Holiday Inn Express in Orange City, Florida, contacted me to see if we'd be interested in visiting & reviewing the hotel in Orange City. I was thrilled & my kids were ecstatic ~ we love going to Florida! Dena mentioned that Orange City is located right between Orlando &several nearby beaches, including Daytona & New Smyrna. I picked last weekend for our visit because the kids had Monday off from school for Columbus Day. The only thing I didn't plan for/predict was a tropical disturbance coming ashore last Friday, the day we arrived! But we weren't going to let that stop us from having a great time in Florida. My husband had to work, so the kids (plus Katie's BFF, Lexy) and I left our home north of Atlanta at 6 am. (It's about a 7 hour drive to Orange City from our home). 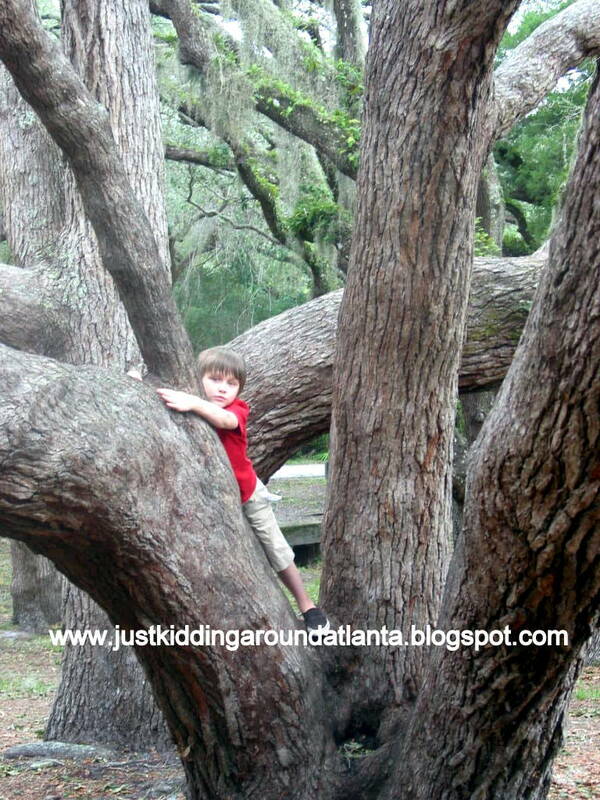 We drove down to Macon, cut over on I-16 to Dublin, GA, and took the scenic route down to Jacksonville, FL. 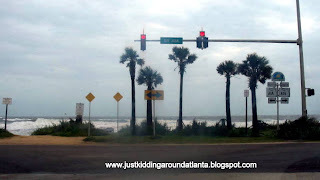 We stopped there for lunch, then headed over to A1A so we could make a stop at the beach. The nice thing about A1A is that you get to see the beautiful Atlantic Ocean alongside some gorgeous beach homes. It's a very scenic, very calming drive! We went to Marineland, which is the spot my family spent several Spring Breaks visiting when I was a teenager. Unfortunately, the hotel we used to stay at back then (which was adjacent to Marineland) has been demolished and replaced by a boardwalk & park. We stopped there so the kids could walk on the beach for a bit despite the rain, wind & huge waves crashing on the shore. We also stopped at Ft. Matanzas Park, which is very close to Marineland. You can take a boat to the fort, but this time we stopped only long enough to let David climb some of the beautiful trees there & stretch our legs a bit more! Afterwards, we hopped back onto the interstate. It was about an hour drive to Orange City. The Holiday Inn Express was easy to find since it's right next to the exit! We had no problems checking in and the staff there were very helpful. The hotel has a large lobby & gathering room, plus a nice dining room. The kids & I headed to our room on the 5th floor and it was really nice! Two comfortable beds with both soft & firm pillows, a mini fridge, microwave, large work desk (free internet included) & a spacious bathroom awaited us. The bathroom came complete with a coffee maker, a makeup/shaving mirror, & hairdryer. It had everything we needed! Our room was close to the ice machine & vending area as well as the elevators. The hotel was recently renovated so everything looked great! The rain was picking up, and it was time for dinner so we logged onto my computer to find some options. There were plenty of places to choose from at our exit We found a Tijuana Flats restaurant just down the street. We all love their food, so that is where we went. If you haven't eaten there, you've got to give them a try! The food is delicious, and the hot sauce bar is awesome. Because the weather was getting worse by the minute, we took our dinner back to the room to eat & watched a little tv before bedtime. The beds were so comfy and everyone slept great! David woke me up before 7 am on Saturday because he was ready to visit the breakfast buffet downstairs. It's complimentary with your room & I have to tell you that it was fantastic! There were the usual foods you find at buffets: cereal, muffins, biscuits, toast, bagels, oatmeal, scrambled eggs (served with sausage one day, Canadian bacon the next) They also had yogurt, several varieties of milk (including skim, which is what we drink), cream cheese, etc. They offered a variety of beverages: orange & apple juices, coffee, tea & hot cocoa. There is something for everyone, even your pickiest eater. David's most favorite thing there was the pancake machine. Moms, you will seriously want to pack this in your bag and take it home! You push the start button, place your plate under the side and soon two golden brown, freshly made & delicious pancakes come out! David loved this machine. A very nice lady named Linda was working down there both days. She was so sweet to David. She helped him use the machine, then encouraged him to get more if he was still hungry, which he took full advantage of! The girls went down for their breakfast after they showered & dressed, and were also happy with all the choices available. Did I say that it was raining all weekend? It was pouring, actually! We had planned to visit Blue Springs State Park, but that was out of the question. If you visit, please go to Blue Springs! It looked amazing online, I can only imagine how lovely it is in person. We'll go there on our next trip for sure. If you are there during the winter months, you'll be able to see the manatees who winter there. The park also offers River Cruises. We ended up visiting Flea World flea market near Orlando first. We didn't stay long because the rain was dripping through the ceiling in places & the parking lot was one big puddle. But while we were there, my son found a Star Wars booth that sold figurines for 50 cents each - he was one happy boy! Then it was time to stop back at the hotel for a quick break. We decided to get lunch, then we could drive over to the Beach so the girls could get some airbrushed shirts. We drove through Chick Fil A in Orange City, then hopped back on the interstate. About 30 minutes later, we were looking at the crashing waves of the Atlantic! It was still very stormy so the kids couldn't hang out at the beach like they wanted. I did let them mess around on the shore for a little bit, looking for shells & posing for pictures. 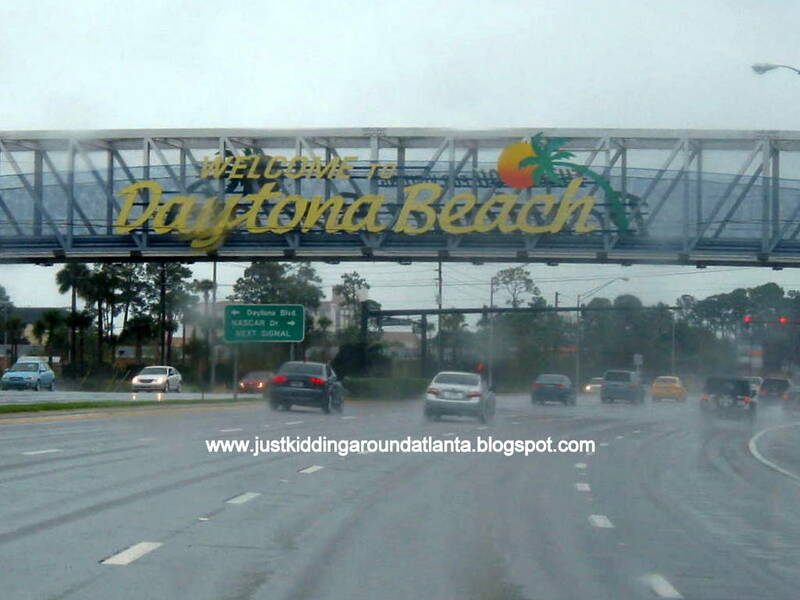 I love that you can actually drive on Daytona Beach, how cool is that? 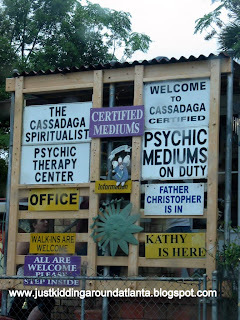 There were only two cars out there on Saturday due to the weather..
After a little souvenir shopping with the kids, we decided to visit Cassadaga. 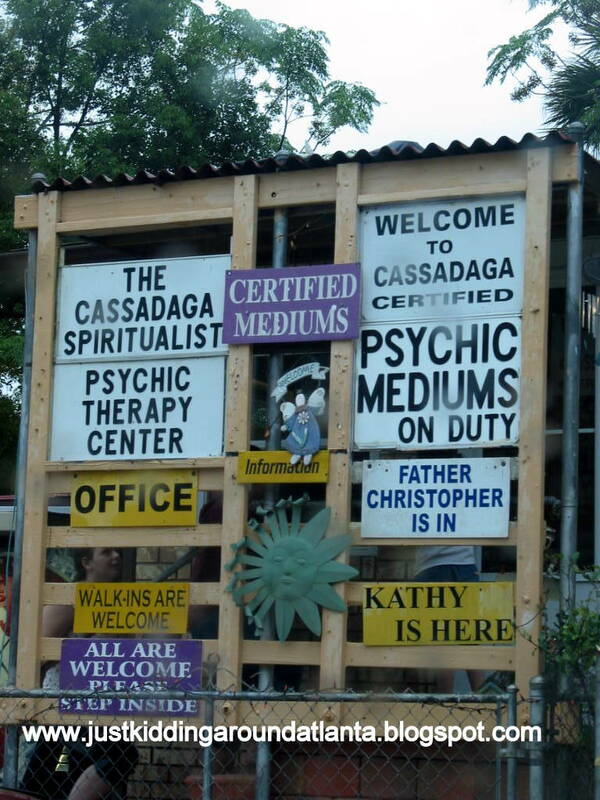 It's a small historic town located a few minutes from Orange City, known for its psychics, mediums, and spiritual healers. The girls thought about getting a reading, but when they heard it was $40 per person at the place we stopped, they decided to pass. It's still a lovely town that's on my list to visit again during our next trip! When we got back to Orange City, we had a nice dinner at Bob Evans. It's located right next to the hotel so it was very convenient. We all love Bob Evans but there aren't any located in Georgia. that's why it's always a treat to go there when we are in Florida! One tradition the kids and I have is to always share an order of fried cornmeal mush with syrup - it is so good. 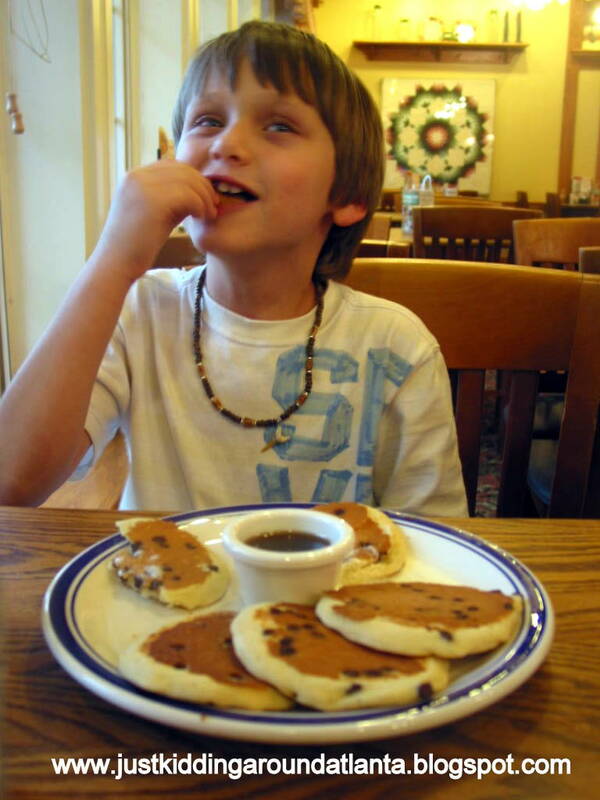 The girls and I ordered turkey & dressing, David decided on pancakes - yum! Bob Evans restaurants are consistently bright, cheerful, clean & inviting! After dinner, we also stopped at the Perkins Restaurant & Bakery two doors down for some treats for the long ride home on Sunday. My kids love their crazy cookies - 1/2 sugar, 1/2 chocolate chip! Back at the hotel, the girls checked out the hotel's fitness center and enjoyed their workout. 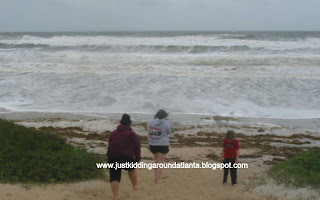 We also brought our bathing suits but it was a little too rainy & chilly for us to use it. Sunday morning we ate breakfast early & then it was time to load up the car & check out. Once again, check out was a breeze. During our visit, each employee we encountered was helpful & customer-service oriented. Dena makes sure everything is just right for your stay! I know we'll be back at the Holiday Inn Express Orange City in the not so distant future! 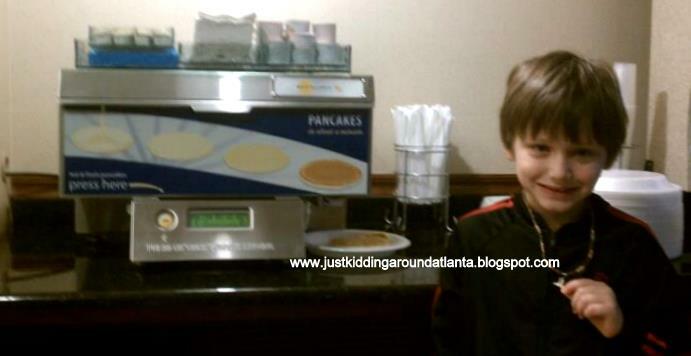 David's favorite thing about the hotel: The pancake machine! Katie's favorite thing about the hotel: The super-comfy beds and pillows! Don't forget that you can also drive over to Orlando for the day if you want to hit the big theme parks. Billboards along the interstate proclaim Orange City to be the "quieter side of Orlando" and they aren't kidding. There is very little traffic, it is convenient to I-4, and it's much calmer than Orlando's sometimes frantic pace! The drive to Orlando is really easy! We wanted a quick getaway that didn't break the budget this time so we decided to go low-key, no theme parks. I only wish we could have seen Blue Springs State Park & the Zoo, but you can't do a thing about Mother Nature! Next time you plan to visit Orlando, I encourage you to check out Orange City, and the Holiday Inn Express there. It just might become your new home away from home when visiting Central Florida. complimentary two night stay at the hotel! How fabulous is that? Click on the "read more" link for all of the details! If you already follow me via GFC, Twitter, FB, etc. just leave a blog post comment below stating that you do and then click "I did this" in the rafflecopter entry form for each thing you do! UPDATE: Congrats to Scottsgal ~ random.org picked your comment as the winner! Disclosure: I was provided with a complimentary stay at the hotel plus gift cards to use at Bob Evans. We also received passes to local attractions, but due to the weather, we weren't able to visit those. No monetary compensation was received. All opinions given in this review are my own honest opinions. Holiday Inn Express is providing the giveaway prize of a two night stay, as well. MommyGaga, SimplyStacie, TheThriftyMama, FunBeingFrugal, and many other wonderful blogs!! I would go to Orlando first - I have some tickets to Disney I need to use! I would love to visit the beach! I live in WI so I would go to the beach first!! Great giveaways, thanks!